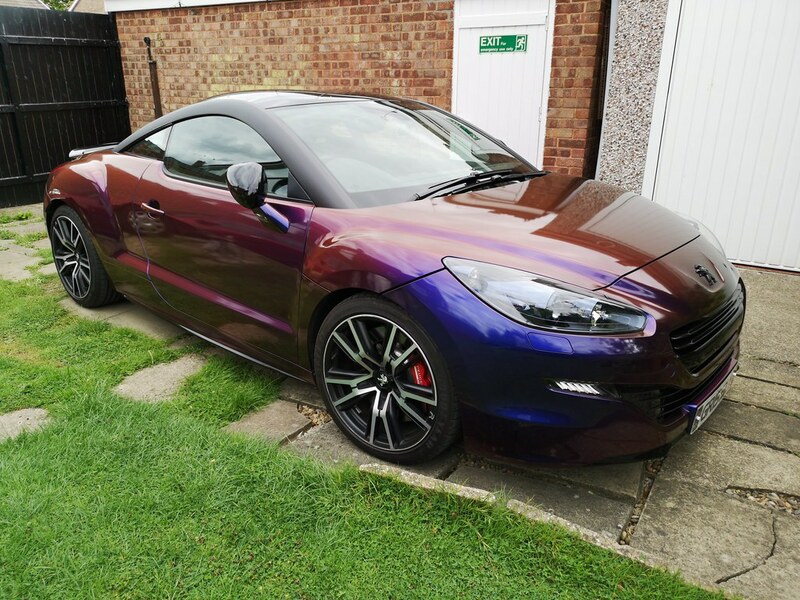 I own a RCZ R in black with black plastic arches - the arches have unfortunately discoloured and they look terrible - it's out of warranty so the manufacturer won't do anything about it. I was hoping to get them wrapped but the first person I spoke to said that vinyl won't stick to non-painted surfaces i.e. plastic arches so this is a non-starter. Can anyone advise if they have done this please? Last edited by Philip968 on Thu Sep 06, 2018 1:03 pm, edited 1 time in total. You could try Topaz polish by Autosmart. If you use a soft nail brush to get into the grain, and even a soft shoe brush to bring the polish back out, finish with a soft microfibre cloth and the discolouration should go. A lot cheaper than trying to wrap them. Notice the grill, no more silver grills they are wrapped black, not the best to show that but you get the picture ! Good Luck in whatever you do. M.
Pictures would be helpful here. I haven't had any issue with those arches on my R. They still look like new. The only detailing I do to them is to apply some Meguiars Ultimate Black twice a year. That's it. Thanks for the replies so far, I've tried polish and nothing seems to make a difference, they appear to be damaged, I would say corroded if they weren't made of plastic. Jeez, they look atrocious! That car was not sleeping in a garage. Now I do understand why you want them to be wrapped. Maybe someone who has used plastidip could advise if that might work ? If so that might be the best/cheapest solution. They are the worst black roof arches I’ve ever seen. Wonder what caused that ? I wonder if someone has coated them with something and it’s that that is coming off? If not I would either have them wrapped which they will wrap or like mine are have them sprayed gloss black? Or whatever colour you fancy. I noticed in your photo you have a carbon fibre roof too that’s a £1400 option! I really wish I knew what caused it, so I could make sure it didn't happen again and warn other people not to do it either. I'd still like to hear from someone who has had specifically "black plastic " arches wrapped as I'm being told it can't be done. To those that have had their arches painted, were they the black plastic ones or the silver ones? That's what mine are like on my HDi, but not to the extent yours are at. I would have thought all the arches are made of “metal” with different finishes, there have been the standard silver polished, matte black, smoke and champagne arches so I doubt they are all made from different materials I still don’t understand why people are saying you can’t wrap plastic?? Unless what they mean is because your arches are textured the texture will show through the vinyl? Mick Plecodoras has had virtually everything wrapped on his R including loads of plastic parts. The black arches are a type of plastic, I found that out when mine were removed by the C.I.D., sorry, I meant the window fitter. I did wrap my key fob, which is plastic, so I know it can be done, but over the years it started chipping away, so I peeled it off. If you do remove them, they are very flexible so maybe it would be easier to wrap them in situ. I know silver arches have been wrapped by forum members, so maybe they can help with how they did it.